Mayo went down to Dublin last weekend. 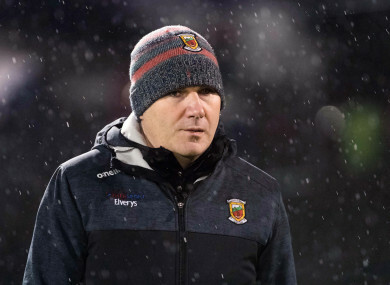 JAMES HORAN HAS made six changes to the Mayo side that will take on neighbours Galway tomorrow night in Elverys MacHale Park. Rob Hennelly, their best performer in the heavy defeat to Dublin on Saturday night, is replaced by two-time All-Star David Clarke between the posts. Ger Cafferkey, Paddy Durcan, Ciaran Treacy, Andy Moran and Brian Reape also drop out of the team, with Chris Barrett, Stephen Coen, Diarmuid O’Connor, James Durcan and Darren Coen all introduced. O’Connor will captain the side while James Durcan is set for his first league appearance of 2019. Email “Horan rings the changes for Mayo's clash against rivals Galway”. Feedback on “Horan rings the changes for Mayo's clash against rivals Galway”.